Any opinion or expirience with that issue? Terrry. I hope you were the guy on ebay who bought the mobile unit for $46 today. Terry, I don't know how long your Zeo should transmit, but I would think it should be longer than 8 or 9 hours. Perhaps a recharge will help. As for your deep when awake, I can tell you that if I wear my Zeo away from the bedside unit (like down the hall to the bathroom), It will often record that awake time as deep. I have assumed it to be because of the lower amplitude signal received (deep sleep produces low amplitude waves). Maybe there's a clue there for you. Is something causing interference with your link? I see one of your deep readings, around 8:30, occurred in the middle of what appears to be a signal drop. Is this a new headband? If not, could it be dirty? If so, perhaps a gentle wipe with a cloth soaked in rubbing alcohol would help. Zeo did recommend washing in Woolite and cold water, if required. Also, make sure the snaps which hold the sensor to the transmitter are clean and properly seated. Because the hypnogram is not a real-time presentation, but is produced by an algorithm which uses averages of sleep epochs both before and after a given moment in time, the presentation may not accurately display an instance of awake while looking at it. Zeo has published an explanation of this... I have it somewhere. I'll try to find it and include it by edit. I just had tested Zeo when i had been awake. It showed all normal but a couple of times "awake degree" just missed. I mean that they was before but than Zeo had begining next degree the two or four degree (before last) disappeared. Ok, i got it why my awaking may not be showed, but i don't get why some degree was and then disappeared. Maybe it's a glitch of app or i need the latest firmware? But i didn't find the firmware for mobile version. P. S. Sorry for my english i didn't speak in it for a long time. Terrry, I didn't quite understand your last post, but I think you are trying to determine how well your Zeo is working by testing it while you are awake. Remember, the algorithms of the Zeo assume the wearer is asleep or attempting to sleep, therefore testing while awake may not work. Also remember that the hypnogram display you see on the phone is not real time. The Headband transmitter sends updates every few minutes to the phone. When you put the headband on the dock to signal "end of night", the headband will send the final data to the phone, which could result in the change of the last one or two time segments of the displayed hypnogram. I think the best test is to wear the headband a few nights to see if the results are consistent and reasonable. Thanks for link. I didn't know there is an accelerometer in mobile version. But it's sad that the app don't use it. 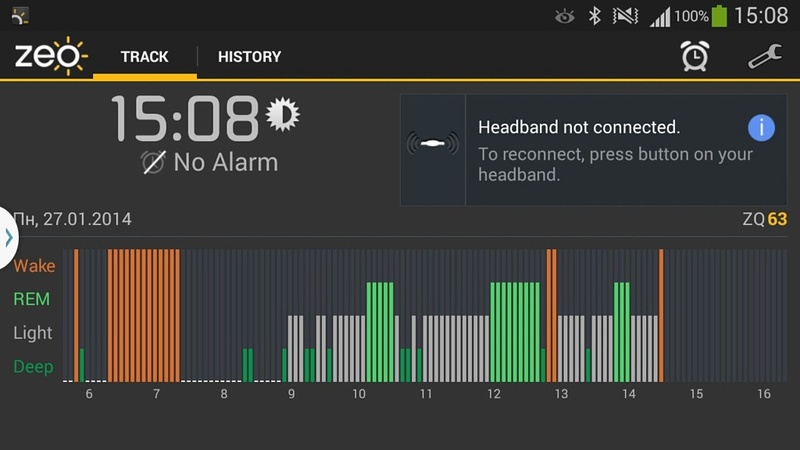 Maybe anybody knows can i sync the headband with smartphone only in the morning not all night? I have been working on an Excel spreadsheet for displaying Zeo Bedside information. Excel has the ability to read xml files and so I convert the zeosleep.dat file to zeosleep.xml using ZeoDataDecoder and then use that as the data source for excel. It is pretty cool really. In doing that, I note that the Zeo Decoder Viewer gives the wrong (or misleading) information for time to sleep. The decoder viewer (ZeoDecoderViewer0.2a2Release) gives the number of 30-second epochs for the time to sleep. The actual time in minutes is 1/2 of that. I discovered this in comparing the xml file output with that of the decoder viewer. Now, it may well be that the decoder viewer output is intended to be in epochs for time to sleep, but all the rest of the information is in minutes, not epochs. This is meant to be an observation only and not a criticism. Believe me; I am thankful for all those who have provided information on this forum. It has helped me a lot and I am indebted to you. It does look like the viewer is reporting twice the time to sleep (Z) as it should. As you point out it is not converting 30 sec epochs to minutes, but is instead reporting the number of minutes equal to the number of epochs. I've attached a screen shot grouping which confirms this. 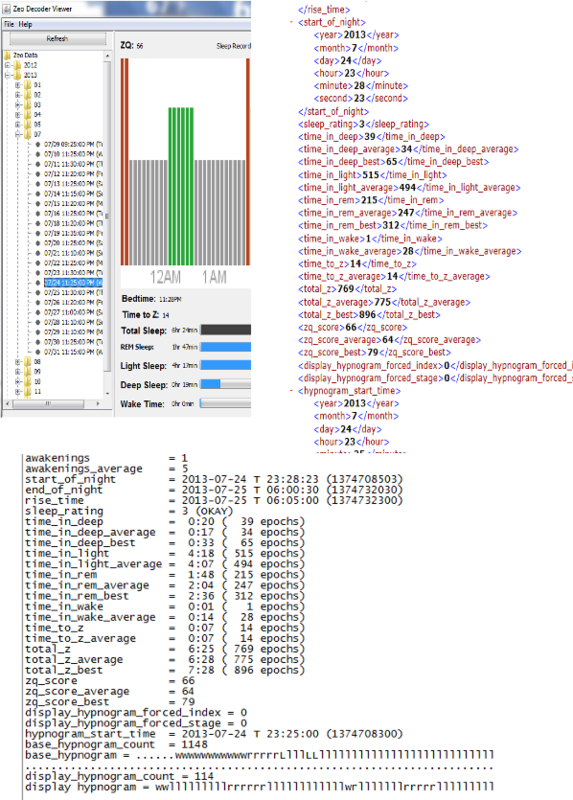 At the top left is a snip of the viewer for 7.24.13, to the right is the corresponding viewer xml file. Most interestingly, on the bottom is the text output of the data decoder for the same night which shows both the number of epochs and the time in hours and minutes. While the viewer shows a time to Z of 14 minutes, the data decoder text file confirms it is actually 14 epochs or 7 minutes. Nice screen shots of everything, Jay. I had looked at all of that as well. Also, the Zeo Decoder Library documentation says in section 4.4.4.28 "time_to_z Time to fall asleep, as a count of 30 second epochs, for the current night." Also, section 4.3	Human Readable Output Format, has an example similar to that you showed in your text output which also indicates the time is 1/2 the number of epochs (with some rounding for odd epochs). Thank you for your research. The good things are that 1) I will just remember that the time_to_z is in epochs and 2) it is a parameter that I am not too interested in. Two things do interest me in the data I am getting are that I have very little Deep Sleep and a whole lot of REM sleep (40%+). Last night it was near 50%. I would like to find a way to increase the Deep Sleep, especially at the expense of REM. Last night, I slept with a tape recorder and an IR video recording going. I have RBD and want to catch it in motion. Next, I really need to find a accelerometer device that gives me magnitude of movement, not just number of movement. Hi Bob, I suffer from sleep apnea so I am little familiar with abnormal sleep conditions. I also suffer from a lack of deep sleep, primarily from disturbed sleep, I believe. From my research, deep sleep is hard to increase. I have found exercise and vitamin D3 (to treat a deficiency) somewhat helpful. Since my REM is normal, I haven't studied it much, but I think Meds can have a big influence. It includes links to my homemade IR video recording equipment and some Zeo stuff. MaxDarkside and BasementDwellingGeek are the principal contributors. Judging from your posts, I think you'll find some of this interesting. BTW Bob, I thought you had a mobile unit. Do you now have both a mobile and bedside? Hello everyone, I have a problem: the data is loaded, even zeodata in the folder, but when I open the viewer application to display the graphics seems to be loading but then does not load at all. Does anyone know how to help me? can start taking the folders in the sd card? An open source Java based application originally published by Zeo. Georgia, when you open the viewer do you have a Zeo Data tree of dates in the navigation pane (as shown under "Refresh") in the example above? Did you click on a date to be displayed? Or do you not see the viewer at all? thank you very much for your reply and I'm for sorry for my english. I figured out the problem: the measurements were too short .I'm sorry if I made you waste your time and thank you very much again. Will the doubled time to sleep fixed in the decoder viewer? Or will the Decoder not developed anymore? Mike, the decoder viewer is no longer being supported by Zeo (or anyone). Someone could write and post a patch to fix it, I suppose, though as Bob implied above, I'm not sure it would be worth the effort. In the meantime, the actual data that is available through the xml output file is correct, although it is in 30 sec interval epochs, if you are charting it, and the time to Z displayed on the Bedside unit itself is correct. ... After reading a recent article on the impact of moon phases on sleep, I'd like to chart that, but I haven't gotten around to it. This is simply a record of something I did out of curiosity, totally unchecked. I don't even know that a continuously variable "newness" is a suitable variable. I've had total success using disposable ECG electrodes. Can be expensive using fresh electrodes every night, but I have outdated packs, and use electrodes from them for many months after opening, storing in humidors. I can get about 10 days from each set of electrodes (I haven't tried to truly maximize the time, just replace them when I seem to be getting dropouts.) About 2 days with new electrodes, another 4 days with Hypafix tape (better than Micropore or Transpore as more conformable, also cheaper), then, after smearing as little Tensive as possible on each electrode with a finger (once only) I get another 4-6 days. Details (necessary) in post #161; this post updates a few points. PS I slightly updated post #161 on 15 Feb 14 with later conclusions. Edited to clarify Tensive only applied once. I have a few years of my own data, naturally, but I've also managed to get data for 2 other users. If you or Jay or anyone else would like to send me your CSV or .dat which I can post and then use in my analysis, that'd be great - the more different peoples' data I have, the less it may be my personal idiosyncrasies. What I did was use a library to get for each date the % full and regress on that per night. Essentially what I did, but I just took a start date of one known new moon near the date range of interest; new moons are 29.5305882 days apart. My data are not good enough to say anything, really. I also forgot to say that I took a small dose of hypnotic some nights! If you or Jay or anyone else would like to send me your CSV or .dat which I can post and then use in my analysis, that'd be great - the more different peoples' data I have, the less it may be my personal idiosyncrasies. I see I have missed some posts here. I have both the mobile and bedside Zeo units. I started with the Mobile and wanted more info so purchased the bedside. I am now just about ready to hook up the serial port connection and see what is available from it. Thank you for the information on your sleep lab and accelerometers. I will look at those shortly. Good information on extending the use of disposable ECG electrodes. I have been purchasing some from Ambu and can get two uses out of them. I have not tried your electrode life-extension techniques but will look into getting the Hypafix and Tensive. I do like the convenience of just putting on a headband.